The breadth of history on show in London for all to see never ceases to amaze me. 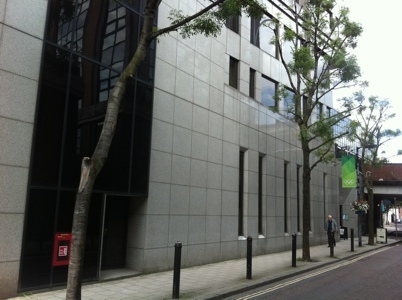 Last week I saw the remains of a Roman bathhouse hidden below a City office block. This weekend I viewed, beneath another modern building, traces of the first theatre to be built south of the Thames. Near both the reconstructed Globe playhouse and modern day Borough Market, the Rose, built in 1587, started an exciting trend for theatre going on the South Bank. Christopher Marlowe’s Dr Faustus, The Jew of Malta, and Shakespeare’s Henry VI Part 1 and Titus Andronicus were all performed on its stage while the playwrights were still alive. The remains of the Rose, preserved in a covered area in what was to be an underground car park, are unique in that we don’t have access to the complete site of any other Elizabethan theatre in London. Much of what we know about theatre-going in this period in history comes from here, not just because of the fine archeological evidence but also because the owners kept extensive records. Campaigners fought hard to stop the remains, unearthed during a major archeological dig in the late 1980s, being built on when a new modern building was constructed. In the mass dark shed-like building you can see where the original theatre would have been, although the actual foundations are currently a metre under ground to preserve them from the air. Last week the trust anounced it was in the process of submitting a Lottery bid which, if successful, would allow for the excavation of the remaining third of the site, currently an area where highly-rated intimate plays are staged to help fundraise for the project. Once the dig is complete, glass will be placed above the foundations, creating vacumn and thus allowing the remains to be on show. In the long term, it is hoped that Rose can be rebuilt on its original footprint. The way Rose Court was built above means that it won’t be affected. So hidden away below the 1980s building will be a wonderful Elizabethan galleried playhouse, in the style of the re-constructed Globe but on a smaller scale. It must have been an incredible experience seeing a play at the Rose in it’s hey day. Over 2000 people woud have packed into a cramped space and some have suggested that the atmosphere was like going to a football match or rock concert. 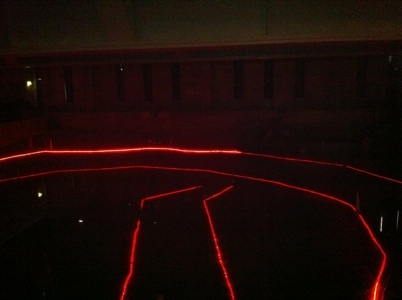 On the open day I went to yesterday enthusiastic volunteers used an array of red lighting to show where the stage and outer walls would have been. In a way the Rose became a victim of its own success. The venue became very profitable and was enlarged, but in the end it could not compete with the likes of the Globe, so when the lease expired it was not renewed and the theatre was left to decay. It is exciting to think, that after a 400 year absence, performances could take place on the original stage again. The 1988 archeological dig brought an array of interesting finds, including jewellery, costumes, make-up brushes, money pots for collecting admissions, a bannister and even a cannon ball that was used to create the sound of thunder during performances. Some of these items feature in the British Museum’s new ‘Staging the World’ exhibtion and also the Museum of London. Trustees and the wider world are hoping that the next act of excavation will be just as illuminating and that we will get to find out even more about the Elizabethans and their love of theatres.